When Ryan Heller speaks – you sit up and listen! His wisdom mixed with his enthusiasm made Ryan Heller the ideal facilitator for our Area School this year. What a breath of fresh air – a 3D breath that is! Magic City Chorus was thrilled to host 62 singers from 6 choruses; Magic City Chorus (Saskatoon), Battleford Blend Chorus (North Battleford), Prairie Gold Chorus (Regina), River Hills Chorus (Wainwright), Alberta Heartland (Edmonton) , Hearts of Harmony (Red Deer) at the Radisson Hotel in beautiful downtown Saskatoon along the South Saskatchewan River. It’s always great to meet new people from other choruses and learn more about how others are doing in the region. We were also very excited to host Marsha Fulton, who attended the area school as a representative from Region 26. There were no strangers in this room, just friends we hadn’t met yet. 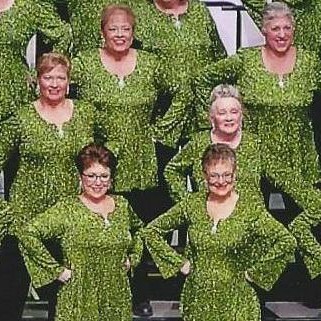 Magic City Chorus was lucky enough to be the demo chorus for the weekend. What a treat! The energy that Ryan brought to the weekend was AMAZING. Let me tell you a little more about the dynamic and talented Ryan Heller, he leads the International award-winning Sweet Adeline chorus, Pride of Portland! Along with the tremendous distinction of being Pride’s Master 700 Director, Ryan is the Artistic Director/Conductor of Chorus Austin (Austin, TX.) and Portland Vocal Consort (Portland, OR). His Master of Music and Bachelor of Music degrees are in conducting and vocal studies from Chapman University (Orange, CA) and Portland State University (Portland, OR). He is a much sought-after chorus and quartet coach, workshop speaker, and guest director. Those who attended will have a picture in their mind for ever, of Ryan explaining resonance with a diagram of a head! We really enjoyed the anatomy and physiology lesson . For most, we weren’t really learning something new, it was just explained in a different way that we hadn’t heard before (mind blown), and made a lot of sense! Ryan’s ideas are great – his lessons will allow us all to change how we sing – for the better! There was lots of time to talk about and practice the concepts, nothing was rushed and the materials were very organized and useful to singers at all levels and stages. We love how Ryan talked about dynamics, instead of making a dynamic plan that makes no sense, tell the story and sing it like you would speak it, you will notice the natural dance of the dynamics in how you speak the words and it will form a natural dynamic flow which will enhance your performance through and though. The Area School was full of interesting topics, fun times, Ah-ha moments and lots of laughs! Thank you Ryan Heller from the bottom of our hearts. We will forever have our mouths open as we hear the pitch blown.